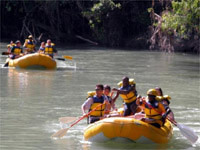 It was in 2002 that owner Walter Gilbert Byles established Caliche Rain Forest Park and Adventure Tours in Montego Bay, Jamaica, first offering rafting and kayaking. Today, Caliche Rainforest River Rafting has expanded tremendously. Now that we operate in Ocho Rios and are about to open up in Port Antonio with three new river runs, our rafters are guaranteed the most sublime and thrilling water rafting experience. Modeled after the famed Costa Rican rafting tours, Caliche Rainforest River Rafting is indeed designed to offer water lovers a sensational Jamaican experience. We offer topoftheline white water rafts made from standard military PVC material. At Caliche Rainforest River Rafting, we also consider safety our priority, and for that purpose we use special life jackets, all rated from Grade IIIV and all extremely buoyant. The faster grades have a head flap to keep the users head above water. Caliche Rainforest River Rafting also provides highstandard helmets and paddles to suit rafters of all heights. In addition, Caliche Rainforest River Rafting always keeps manufacture recommended spare parts, material and maintenance equipment. Our staff is trained by the manufacturers to make all the necessary repairs on the river, which can be quickly tended to with emergency repair kits. Caliche Rainforest River Rafting maintains the highest standard and is committed to delivering satisfaction to all rafters. Because of our passion and drive for excellence, we bring in a trainer every year to evaluate the operation, equipment and new guides. This keeps us current with U.S. and International standards, and helps our rafters feel safe and comfortable when exploring Jamaica's waters with us. Caliche offers and exciting variety of river excursions and rainforest exploration tours. Enjoy the beautiful rainforest in the cool mountains of Jamaica. Have fun with us on our pristine river, whether and expert or beginner, we have two river sections to suit the beginner or experienced white water rafter. Our state of the art self bailing white water rafts, first class life jackets and helmets will give you the wildest ride with the highest margin of safety. Caliche was created in 2001 to share the beauty and abundant whitewater of the rivers of Jamaica with the rest of the world. We are committed to high quality, safety and personable service has helped us become the largest whitewater rafting and kayaking outfitter in the caribbean. Along the way, stop at a local restaurant where you will indulge in a lunch of delicious local cuisine.